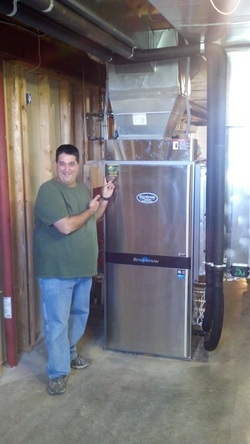 Rochester & Finger Lakes DYI Geothermal - ACES ENERGY ACES-Energy to help builders, contractors and homeowners install renewable energy and geothermal in their home! DIY Geothermal - or need a specific geothermal skill set? Are you a builder, contractor or homeowner looking for some help with your geothermal project? We can offer many of our services and individual job functions to assist you on your next project. We do have a crew and specific loop field installation truck/trailer that can assist you on your next project. We have a extremely talented ductwork foreman responsible for every aspect of sheet metal ductwork, either new construction, full house retro-fit or just a unit change out. We have both a large and mini excavator, that can be used to either do an entire loopfield or tie-in vertical loopfields into the house. Flushing/balancing/start-up - we can offer as little or as much as you would like. Hydronic design/controls - Our in-house engineer and service technician can handle any task you throw at him! Photo caption: ACES-Energy supplied loopfield, unit, controls, buffer tanks and start-up. Customer assisted with basement infloor radiant heat modification of his existing system.